The Hotel Melodia del Bosco is located in the heart of the Alta Badia region, surrounded by the stunning Dolomites. 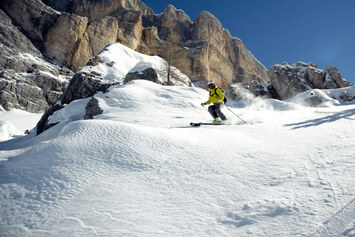 Badia, with its lifts and slopes, belongs to the Dolomiti Superski, the top ski area in the world: this unique gigantic area gives access to twelve ski resorts with a grand total of 1,200 kilometres of ski runs. Experience the thrill of a pristine, untouched slope with the fresh, soft snow under your skis and breathtaking scenery as far as the eye can see! 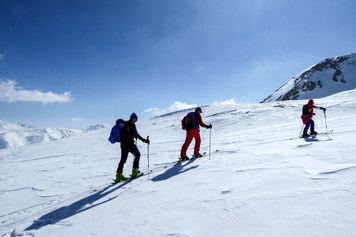 Leave your worries behind and just concentrate on having a good time with our alpine guides: experienced off-piste skiers who know the slopes will take you down unique, unforgettable runs. The Fanes and Puez nature parks are uncontaminated paradises in the heart of the Dolomites. Here wild animals (roe bucks, deer and hares) live freely in the land they have made their own. Discovering these natural treasures on your skis is a unique experience: the silent mountains whisper age-old legends and long lost magic is carried on the wind. 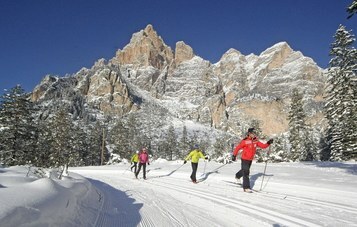 In Alta Badia there are 38 km of cross-country tracks which can either be skated or skied using the classic technique: immersed in the silent natural surroundings, skiers can enjoy the spectacular scenery along perfectly groomed trails. Sign up for our newsletter to be informed of offers and news!